Sweden from the Cheap Seats: Smultron! 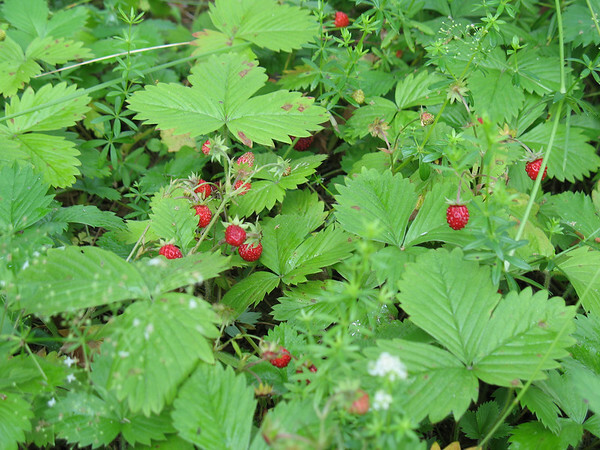 Jennifer Here's another Swedish specialty: smultron, or the woodland strawberry. I had been hearing of this fruit ever since I got here. Swedes adore them. Advertising that wishes to convey a sense of summer often shows a bunch of them strung on a piece of grass. I first asked about them a long time ago: what are those tiny strawberries I see in pictures? "Oh, those aren't strawberries, those are smultron. They are very very good." Where can I buy some? "You cannot. Some people claim there are cultivated varieties but those are not real smultron." Where can I find some? "They are very rare, and quite special. You might not find any." Or, alternately, there might be a big patch of them growing about a hundred meters from my apartment. I wish I could say that I found them myself, but truthfully I had to have them pointed out to me. I was walking to the bus stop yesterday morning, when a guy approaching me suddenly made a 90-degree turn to the right and stepped off the sidewalk and into the rough. I thought that was perhaps taking Swedish shyness a bit too far. I mean, I know now that when passing people you do not make eye contact, you do not say good morning, and so forth, but really, leaving the sidewalk to avoid someone? So I kept an eye on the fellow as I passed, and noticed that he was staring intently at the ground, then bent down to pick something up. I resolved to check it out on my way home that evening... and there they were. The berries are tiny, about the size of a pea, and a very dark red with red seeds. The flavor of them is extraordinary: intense, and strawberry-ish, but sweeter, and with additional notes that are unique. The aroma is heavenly and well worth the mosquito bites one picks up while standing still to breathe it in. Were it feasible, I would suggest that any fellow fruit fancier out there stop what they are doing right now and come visit... except that then I'd have to share. And I'm already behaving like the natives, checking furtively that no one's watching when I go to get some, pretending to be tying my shoe when someone does happen by, answering questions like "Where did you find them?" with a guarded "Oh, you know, just in the woods..."
By the way, if you Google "smultron," probably your first hit will be to a OS X text editor of that name, written by (you guessed it) a Swede. The icon for the program should look familiar by now. Fine then, I will not tell you where to find morels. I planted some alpine strawberries in front of my apartment this spring. I think I've had a total of 3 berries so far. 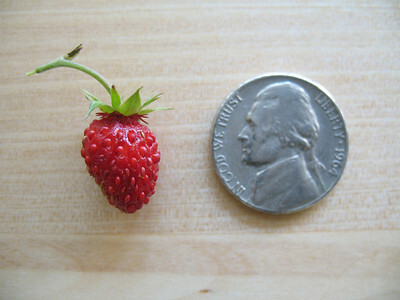 I also planted some so-called everbearing strawberries, which are busy putting out runners and making no strawberries. The alpines look similar to your smultrons. Mora or Less; or, "Vasa the matter w' you?"